This composite image shows Jupiter and its aurorae during a solar coronal mass ejections’s arrival at Jupiter on 2 October 2011. In the image, X-ray data from Chandra (purple) have been overlaid on an optical image from the NASA/ESA Hubble Space Telescope. 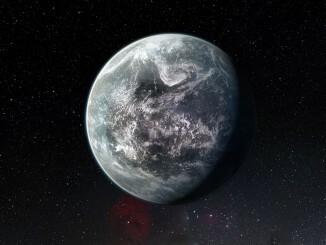 Image credit: X-ray: NASA/CXC/UCL/W.Dunn et al, Optical: NASA/STScI. Solar storms are triggering X-ray aurorae on Jupiter that are about eight times brighter than normal over a large area of the planet and hundreds of times more energetic than Earth’s “northern lights,” according to a new study using data from NASA’s Chandra X-ray Observatory. This result is the first time that Jupiter’s aurorae have been studied in X-ray light when a giant solar storm arrived at the planet. The Sun constantly ejects streams of particles into space in the solar wind. Sometimes, giant storms, known as coronal mass ejections (CMEs), erupt and the winds become much stronger. These events compress Jupiter’s magnetosphere, the region of space controlled by Jupiter’s magnetic field, shifting its boundary with the solar wind inward by more than a million miles. This new study found that the interaction at the boundary triggers the X-rays in Jupiter’s aurorae, which cover an area bigger than the surface of the Earth. 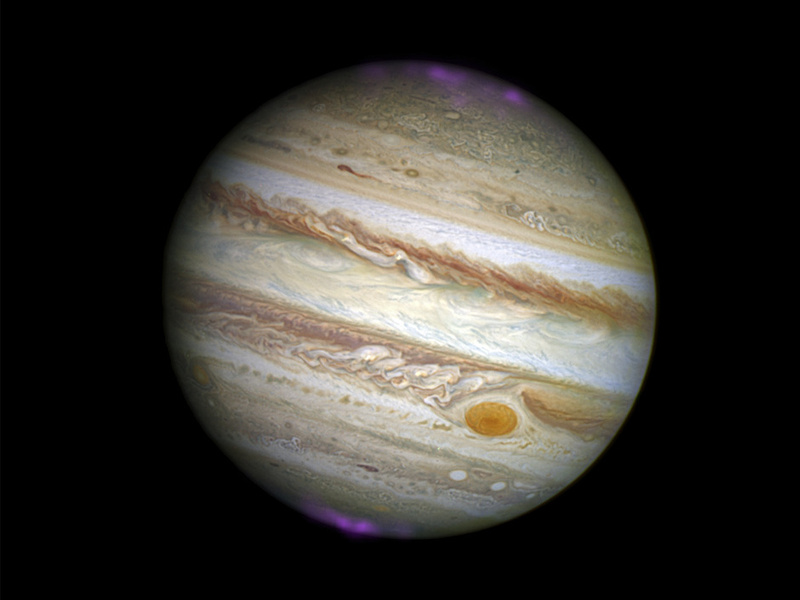 This composite image shows Jupiter and its aurorae on 4 October 2011, two days after a solar coronal mass ejection had subsided. In the image, X-ray data from Chandra (purple) have been overlaid on an optical image from the NASA/ESA Hubble Space Telescope. 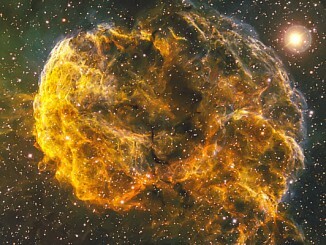 Image credit: X-ray: NASA/CXC/UCL/W.Dunn et al, Optical: NASA/STScI. The composite images above show Jupiter and its aurora during and after a CME’s arrival at Jupiter in October 2011. 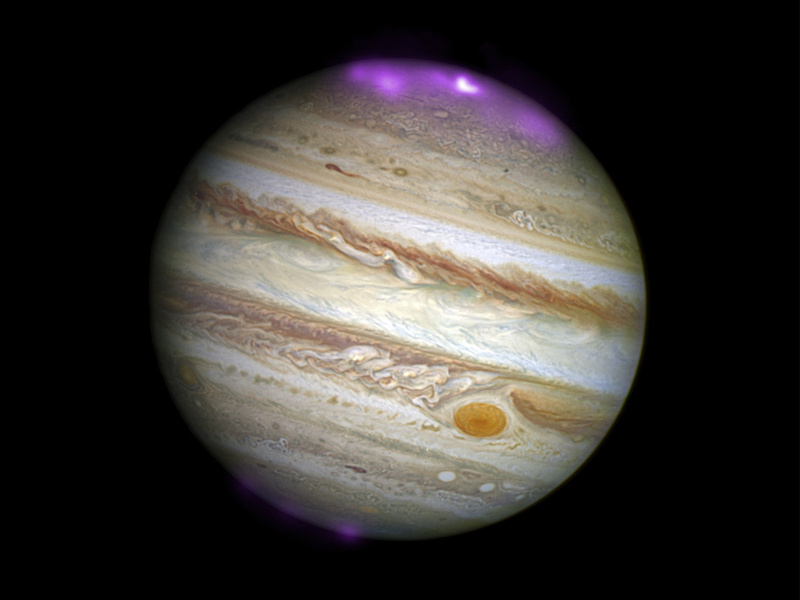 The impact of the CME on Jupiter’s aurora was tracked by monitoring the X-rays emitted during two 11-hour observations. The scientists used that data to pinpoint the source of the X-ray activity and identify areas to investigate further at different time points. They plan to find out how the X-rays form by collecting data on Jupiter’s magnetic field, magnetosphere and aurora using Chandra and ESA’s XMM-Newton. Chariklo is the largest confirmed centaur, a minor planet orbiting the Sun between Saturn and Uranus. In 2014, two rings were discovered around Chariklo. 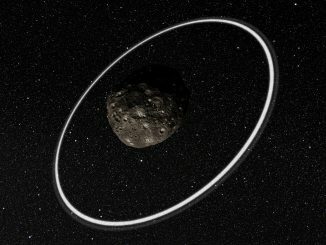 Soon after, scientists discovered that rings likely exist around another centaur, Chiron, but the origin of these rings remained a mystery — until now.